Trying to decide what to make for dinner tonight? No shame in Googling it like the rest of America. When it comes to learning new recipes, it's no surprise that everyone's turning to the search engine giant for advice. 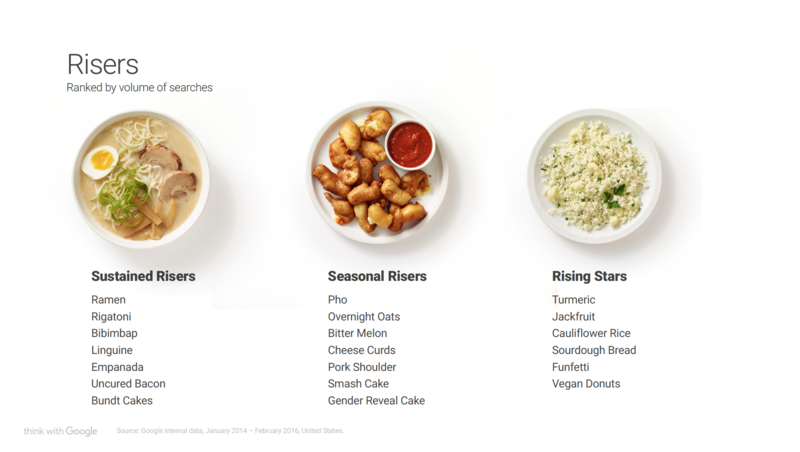 A report released Thursday by Google gives a glimpse into what everyone's cooking, buying and ordering. "With every query typed into a search bar, we are given a glimpse into user considerations or intentions," according to the report. "By compiling top searches, we are able to render a strong representation of the United States' population and gain insight into this population's behavior." 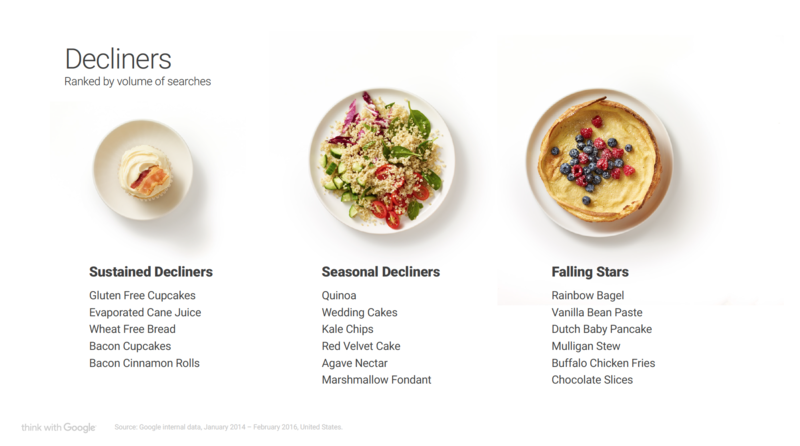 The results are based on the volume of search queries related to food every month between January 2014 and January 2016. Results were measured for year-over-year growth, velocity and acceleration of searches. These insights could have an impact not just on dinner tables but also on brands' bottom lines. For example, when General Mills began to see a heightened interest in going gluten-free, the company decided to adapt the trend into products and advertising. While some may debate how to pronounce pho, there's no doubting its growing popularity. In fact, the fame of pho has increased every year for the past decade, with the pace quickening since 2013, with total searches over the past three years rising 11 percent on a year-over-year basis. 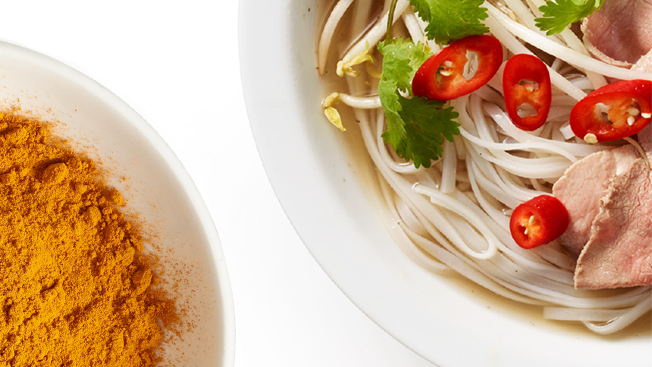 According to Google, consumers want to learn how to make the Vietnamese broth and noodle dish. 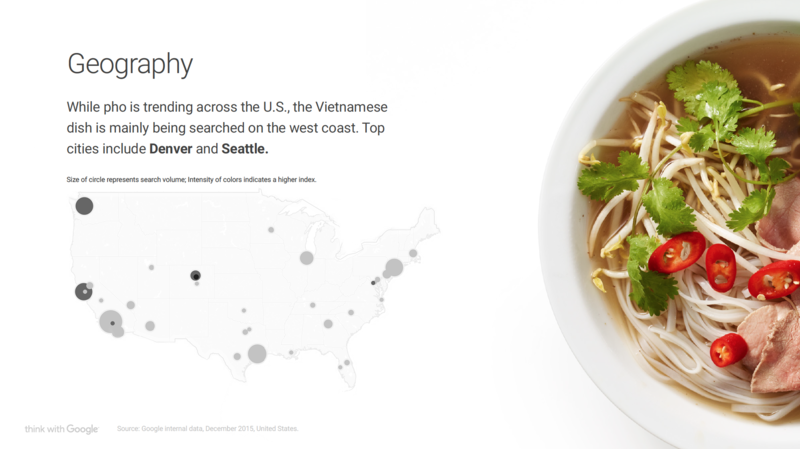 Consumers are 8 percent more likely to search for pho on the weekends, with the most popular cities including Denver and Seattle. 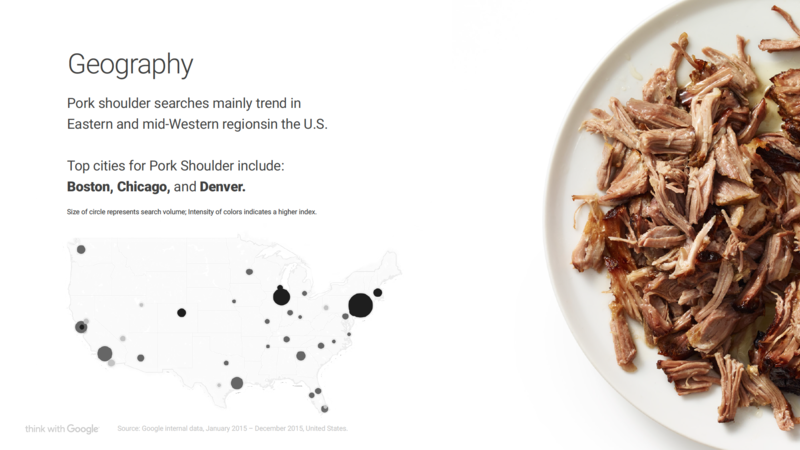 While barbecue has been making its way to the coasts from the South for quite some time, people are now pigging out on pork shoulder. Consumers are researching a number of ways for how to prepare it, and while the most popular videos relate to American-style BBQ, viewers are also curious about trying Korean and Cantonese dishes. Popular cities include Boston, Chicago and Denver. "Americans are taking traditional dishes and giving them a new spin, whether it's with a new flavor or a new method of preparation," the report said. "They're looking to experiment with a familiar meat, and master a new skill. With big cuts of meat and slow cookers, they're turning meals into a full weekend experience that they can do on their own from the comfort of home." Those looking for a picture-perfect piece of cake for the Pinterest crowd might already know about the mug cake—it's essentially a cake inside of a tiny mug. 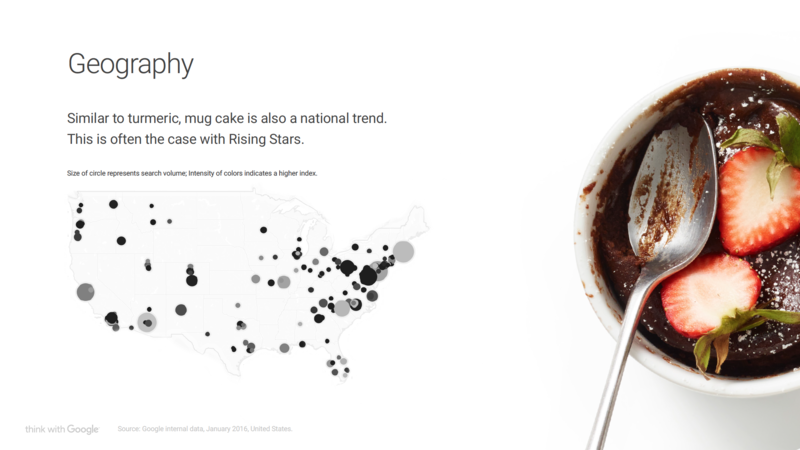 Mug cakes follow the trends of bite-sized snack foods, seeing 82 percent growth from December 2015 to January 2016. As for flavors, Americans are looking for tasty but healthy options, researching chocolate, vanilla, peanut butter and coffee along with words like "vegan," "paleo," "no egg" and "gluten free." The most popular YouTube videos related to mug cake include clips of people making them baked with flavors like Funfetti and red velvet. Turmeric—a perennial plant in the ginger family—has risen in searches by 56 percent from November 2015 to January 2016, as health-conscious consumers look for ways to put the golden spice in smoothies and juices. 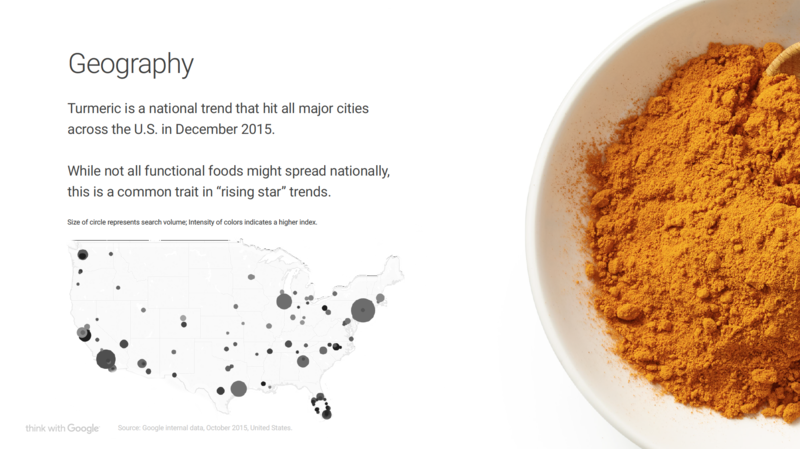 According to Google, Americans are looking to go beyond hunger or craving by educating themselves on the impact of ingredients entered into their diet. "While they may be more aware of the added benefits that certain ingredients are said to provide, they are going online to educate themselves on how to consume these functional ingredients," Google said. "This behavior is more likely to occur during the beginning of the week, when consumers are perhaps most motivated to reboot and optimize their lifestyle habits." 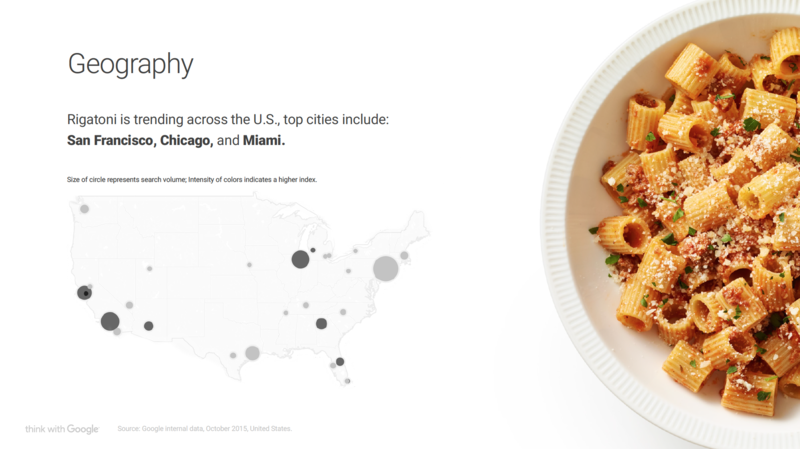 After four years of slow growth, Google search results point to pasta making a comeback. Noodles bubbling up in volume include rigatoni, tortellini, penne, fusilli and linguine. Whether it's baked, in a pie or stuffed, pasta as a whole has seen search results rise 26 percent between January 2015 and January 2016. Top associated keywords include sausage, chicken, beef and even lobster or ham. "Consumers are most interested in making pasta dishes at home on the weekends. They're experimenting with new recipes and sauces that can be prepared at home or picked up at the grocery store. There's interest in understanding the differences between certain types of pasta and their accompanying sauces."